Graphmatech joins SynerLeap. From left: Peter Löfgren, SynerLeap, with Björn Lindh, Mamoun Taher and Zargham Jabri from Graphmatech. Graphene is a groundbreaking material which has many potential application areas within different industries. 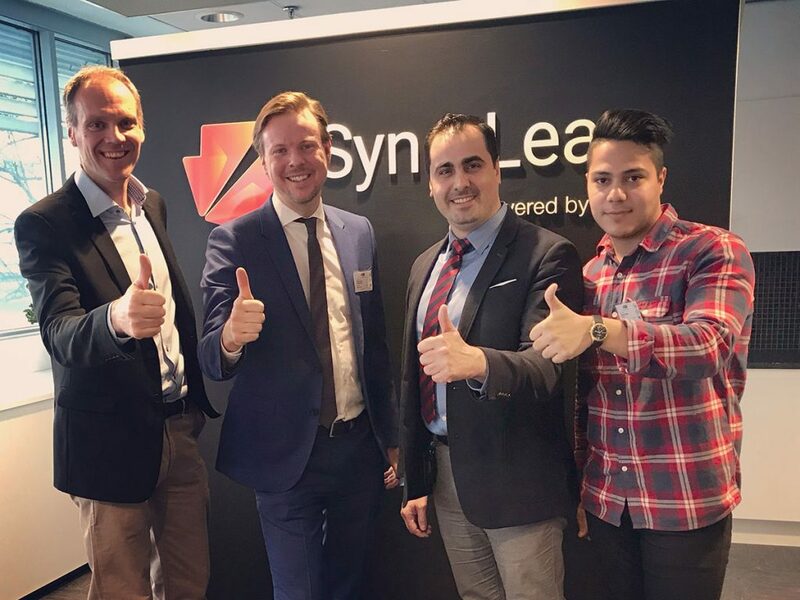 This is why we are so proud to announce that one of the leading companies in this area is joining SynerLeap. The “super material” Graphene was isolated in 2004 and rewarded with the Nobel Prize 2010. It is predicted to revolutionize both the energy sector and the electronics sector, and will enable ultralight materials for e.g. aircrafts. “We joined Synerleap because of the access to the ABB business units, since we see great opportunities for our technology in several areas for ABB, as well as to cooperate with ABB Corporate Research Center and co-develop materials technology solutions for ABB products and technology.” says Mamoun Taher, CEO of Graphmatech. Dr. Mamoun Taher is a material scientist of Syrian origin, who came to Sweden in 2010 for his masters and PhD studies. Since 2015 he has been doing research at the Ångström Laboratory at Uppsala University and ABB Corporate Research Center in Västerås. “Graphmatech is a very interesting and promising company, and we are really happy to have them in SynerLeap! In addition to exciting technology, Mamoun and the team are strongly contributing to the entrepreneurial culture in SynerLeap and our overall target to speed up innovation and maximize value creation. I’m looking forward to the coming months!” says Peter Löfgren, Managing Director of SynerLeap. In this interview from 2016 (in Swedish) ABB’s Research Director in Sweden, Mikael Dahlgren explains why graphene is such an interesting material for ABB. Graphmatech is a Swedish start-up that invents, develops and sells novel graphene-based nanocomposites materials. Graphmatech has invented the patented graphene nanocomposite Aros Graphene® enables full-scale industrial implementation of graphene. Read more about their breakthrough at Uppsala University.